Karon Phi Phi gets you from one of Phuket's top beach destinations to one of Thailand’s most dramatic coral mountain islands. To get to Phi Phi from Karon you first have to cross the Karon Highland pass at Kata and then drive north to Phuket town. From there you take the crossing from Rasada ferry pier out over the Phang Nga Bay through the sea of islands and out to Phi Phi. Karon Phi Phi is one of the great journeys or tours in Thailand. From the golden sandy beaches of Karon, the verdant hill country of the great Kata pass and the old Phuket town you move ever nearer the pier where you gain your first glimpse of Phi Phi Island on the horizon. The 48 kilometres ride out to Phi Phi passes Maiton Island, Koh Doc Mai, Koh Yao and in the north you see 'tens' of islands in the stunning Phang Nga Bay. The deep blue sea contrasts with the bright sun light and the brilliant white of the bow wave. The warm waters are teaming with marine life and often flying fish can be spotted. Dolphin pods are seen during June and September but are often the harbinger of windy and wild weather in the monsoon periods. 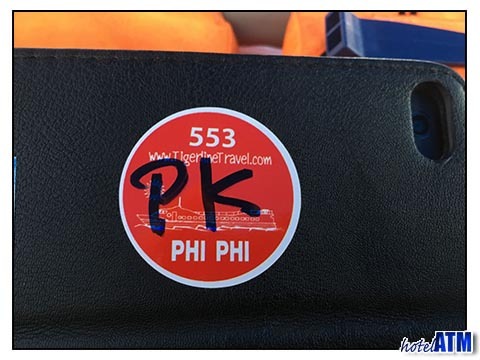 The Karon Phi Phi ferry timetable can be a useful source of information and can take bookings on the various boats that leave at 08.30, 13.30 and 14.30. It also organizes a hotel or resort pick up from wherever the traveller is staying. The 90 minute cruise over to Phi Phi Don Village is a dazzling crossing that gets you into Tonsai Bay. This is where most of the bargain Phi Phi hotels and beachfront resorts are. It is also the village centre where there are many cafes, restaurants and beach bars and a lively nightlife scene. The two main beaches of the village, Loh Dalum and Tonsai have spectacular views of the Tonsai Cliffs and gorgeous and safe swimming beaches. The main Karon Phi Phi tour takes you to Phi Phi Ley to see the matchless scenery and ideal beaches of this now famous island. Maya Bay on Phi Phi Ley is where the movie 'The Beach'was shot. The popular daily cruise takes you on a sightseeing and snorkeling adventure to visit the island where cinema legend Leonardo Di Caprio put together his story about a backpacker looking for the perfect beach. Karon Phi Phi by speedboat tour is a whole different ball game! For many, cruising to a location is the not the point as people want to spend time at the destination. Going from Phuket to Phi Phi by speedboat has speed, adventure and excitement as you rush towards the prettiest islands in the south of Thailand. The speedboat tour ensures you spend a maximum time at the coral reefs like at Bamboo and the maximum time at Maya Bay National Park. The Karon Phi Phi speedboat tour includes the transfer to the Boat Lagoon or Royal Phuket Marina where guests get on the boats. Some travellers are moving from Karon beach to the Phi Phi luxury resorts of Zeavola Phi Phi Resort, Holiday Inn Phi Phi Island and Phi Phi Island Village Resort And Spa. These resorts are in the far north of Phi Phi Don and so need a further transfer up the coast. The resorts provide individual picks from the main pier to their receptions.